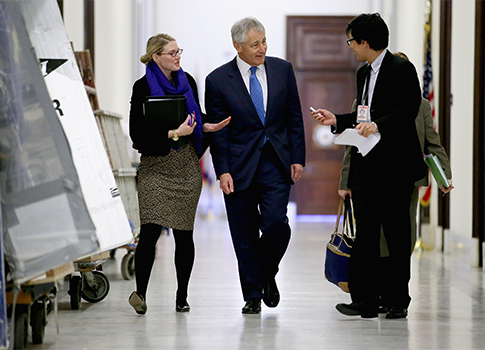 Senate opposition is growing toward former Sen. Chuck Hagel following his appearance before a contentious hearing of the Senate Armed Services Committee on his nomination to be secretary of defense. Conflicting and confusing statements on issues ranging from his past views on sanctions and pressure on Iran for its illicit nuclear program and support for terrorism, to his advocacy of unilateral nuclear arms cuts, were highlighted under questioning before the committee. Senate Minority Leader Mitch McConnell raised the possibility of a Senate filibuster against the nomination. The Kentucky Republican also told the Associated Press on Saturday that opposition to Hagel is growing. Sen. John McCain (R., Ariz.) said on Monday he does not support a filibuster of the Hagel nomination. A committee vote on the nomination could be held as early as Thursday, a spokesman for the panel said. The nomination would then go before the Democrat-controlled Senate. A filibuster by Republicans would require a vote of 60 senators in a chamber divided between 55 Democrats and 45 Republicans. Sen. James Inhofe (R., Okla.), ranking member of the committee, told CNN Monday he also believes the Hagel nomination is in trouble with both Republican and Democratic senators, with Democrats concerned over Hagel’s past comments critical of Israel and of the so-called "Jewish lobby." William C. Triplett, former chief Republican counsel to the Senate Foreign Relations Committee, said Hagel’s misstatements had undermined his chances of confirmation. "As others have, Sen. Hagel has made a nice political living as a Republican trotted out by Democrats to criticize other Republicans. But this fell apart when his [Senate Armed Services Committee] hearing revealed that he's just not very smart," Tripplet told the Washington Free Beacon. Meanwhile, a liberal Republican, Sen. Lisa Murkowski (Ark. ), said on Monday that she is "not certain" she will vote in favor of Hagel’s nomination. Murkowski said later she is concerned about Hagel’s "consistency" in providing differing answers during a private meeting and those during the hearing. "What troubles me now is that, in view of what I have seen, albeit somewhat truncated here, with his performance before the committee last week, I need to go back and gain assurance there was a level of consistency," Murkowski told MSNBC. "And right now, I can tell you, I don’t have that." A Hagel spokeswoman had no comment. Hagel also failed to win a strong vote of confidence from Army Gen. Martin Dempsey, chairman of the Joint Chiefs of Staff, who was interviewed Sunday on NBC’s "Meet the Press." Asked if he is confident Hagel can do the job at the Pentagon, Dempsey said: "I'm not going to speak about confidence. He could be my boss, and when is the last time you saw a subordinate discuss their confidence in their potential boss?" Dempsey said Hagel has "great credentials" and if confirmed "I look forward to working with him." Hagel’s appearance before the committee on Thursday set off widespread discussion that the nomination may be in trouble. Hagel made several misstatements, including "I support the president's strong position on containment" of Iran’s nuclear program, a position that he had to reverse later in the hearing. The administration policy is to prevent Iran from obtaining nuclear arms, not containing a nuclear-armed Iran. In calling pro-Israel advocates "the Jewish Lobby" in the past, Hagel said during the hearing, "I should have used another term and I’m sorry." When asked if he once said Israel keeps Palestinians "caged like animals," Hagel said he would like to go back and "change the words and the meaning." After Hagel referred to the Islamist regime in Tehran as its "legitimate, elected government," Hagel backed down under questioning from Sen. Kirsten Gillibrand (D., N.Y.), who said Iran’s government was behind the deaths of U.S. service members, an attempted attack on U.S. territory, and funding and training terrorist groups. "I can understand if you meant it's a legal entity that has international relations and has diplomatic relations and is a member of the U.N., but I do not see Iran or the Iranian government as a legitimate government. And I'd like your thoughts on that," she said. "What I meant to say, should have said, it's recognizable," Hagel said. "It's been recognized, is recognized at the United Nations. Most of our allies have embassies there. That's what I should have said. And thank you." McCain questioned Hagel’s characterization of the 2007 military surge in Iraq as a "blunder," and whether analysts who believe it helped turn the Iraq war in favor of the U.S. and coalition forces were incorrect. Hagel refused to provide a clear answer. McCain said the lack of a response would influence his vote on the confirmation. Inhofe, who has said he will vote against confirming Hagel, criticized Hagel during the hearing last week for his refusal to join nearly the entire Senate in signing a letter to the president in 2000 supporting Israel. He also criticized Hagel for failing to support sanctions on Iran or the designation of the Iranian Islamic Revolutionary Guards Corps as a terrorist group. Inhofe also noted Hagel’s 2006 refusal to join most senators in petitioning the European Union to designate the Iranian-backed group Hezbollah as a terrorist group and Hagel’s refusal to renew the Iran-Libya Sanctions Act. "The fate of his nomination should be decided by the totality of his record," Inhofe said. "It is the votes that he's cast and the statements that he's made over the many years of his career that will inform us as to his judgment, his view of America's role in the world and his view of the military we require to support that role." "His record demonstrates what I view as a lack of steadfast opposition to policies that diminish U.S. power and influence throughout the world, as well as a recent trend of policy reversals that seem based on political expediency rather than on core beliefs," Inhofe said. Hagel denied that he was motivated by political expediency in his past statements and policy positions. Hagel confirmed several of the controversial past votes and in several cases said the votes were cast based on his policy of not joining Senate blocs and taking positions based on what he believed was right. Perhaps the most serious issue confronting the nominee was Hagel’s repeated claim that he did not support unilateral nuclear disarmament of the United States. However, senators produced portions of a report Hagel wrote with several former senior military and policy officials sponsored by the anti-nuclear weapons group Global Zero. "We're not going to unilaterally disarm," Hagel said in defending his role in the Global Zero report. Sen. Jeff Sessions (R., Ala.), ranking member of the Subcommittee on Strategic Forces, stated that the report calls for "urgent and transformational change in U.S. nuclear force structure, strategy, and posture." Hagel then said the report "didn't propose or call for anything" and was "illustrative" in laying out "scenarios, possibility and schedules." Sessions then said the report stated in several places that nuclear arms cuts could be "implemented unilaterally" with agreements with Russia. "And it does call for these reductions," Sessions said of the report. "In your conclusion, you say the United States should seek to achieve such reductions in 10 years and plan to base its arsenal on a dyad of nuclear delivery vehicles." Hagel said that, despite the explicit wording of the report on unilateral nuclear reduction, "This report was about illustrative possibilities, how could things be done, always, always bilateral, always verifiable, always negotiable, just as we've always done in all our treaties." Hagel’s assertions that Global Zero is "in line with every major national leader in the world, including President Obama, to continue to try to make an effort to reduce our nuclear warheads" is contradicted by the report’s conclusion. The report is critical of both current U.S. nuclear policy and strategy. It states: "The strategy inherited from the Cold War which remains in place artificially sustains nuclear stockpiles that are much larger than required for deterrence today and that have scant efficacy in dealing with the main contemporary threats." It criticizes current U.S. nuclear policy as being focused "too narrowly on threats rooted in Cold War thinking, incurring excessive costs to prepare for an implausible contingency of nuclear war with Russia." The report also said "current U.S. nuclear policy also unnecessarily incurs risks of unintentionally initiating a nuclear conflict" because of "launch-ready" systems. Hagel backed away from criticism of current U.S. nuclear policy and strategy in his written answers to questions posed by the committee. "I support the president’s commitment to a safe, secure, and effective nuclear deterrent as long as nuclear weapons exist," he stated, adding that he supports providing funds to modernize all three legs of the nuclear force—land-based missiles, submarine-based missiles, and bombers. Sen. Kelly Ayotte (R., N.H.) questioned Hagel later in the hearing about the Global Zero report and its call for eliminating all ground-based strategic missiles. "This report says that the president could implement these unilaterally, although that's inconsistent with what you say is your position, yet you signed off on this," Ayotte said. "Why would you ever put your name on a report that is inherently inconsistent with what you're telling us today, is that you've never been for unilateral disarmament as a possibility?" she asked. "Well, as secretary of defense I won't be signing off on reports in the same way as a private citizen, obviously," Hagel said, again denying the recommendations of the report were recommendations and instead saying they were illustrative scenarios. On Israel, Hagel said he has always been a "supporter of Israel" and "in some cases I have said I’m a strong supporter of Israel." Freshman Texas Republican Sen. Ted Cruz criticized Hagel during the hearing after playing a portion of a 2009 Al Jazeera television interview when Hagel agreed with an email questioner who said the United States is the "world’s bully." "Can the rest of the world be persuaded to give up their arsenal when the image of the United States is that of the world's bully? Don't we indeed need to change the perception and the reality before asking folks to lay down their arms, nuclear or otherwise?" Hagel was asked during the Al Jazeera interview. Hagel replied: "Well, her observation is a good one, and it's relevant. Yes, to her question." "Do you think it's appropriate for the chief civilian leader of the U.S. military forces to agree with the statement that both the perception, ‘and the reality’ is that the United States is, ‘the world's bully?" Cruz asked Hagel. The former senator replied: "I didn't hear her say that, by the way, of the United States." "And I think my comment was, it's a relevant and good observation. I don't think I said that I agree with it," Hagel said. Cruz stated: "With respect, I think the record speaks for itself. It was in writing that she said the U.S. is the world's bully, that it is the reality. And your response—you did say you agree with it." Even the liberal New York Times questioned Hagel’s performance during the hearing. Reporter David Sanger wrote in a post on NYTimes.com that Hagel’s misstatements on U.S. policy on preventing a nuclear-armed Iran instead of containing Iran sent "an inconsistent and confusing message" to Iran. "[I]n the weeks of preparation for his Senate confirmation hearing to be defense secretary on Thursday, either no one explained that to Chuck Hagel, Mr. Obama's nominee for secretary of defense, or he forgot it," Sanger said. This entry was posted in National Security, Politics and tagged Armed Services Committee, Chuck Hagel, Congress, Jim Inhofe, John McCain, Kelly Ayotte, Lisa Murkowski, Middle East, Mitch McConnell, Obama Administration. Bookmark the permalink.